Hyphens seems to cause way more grief than their tiny size merits. In this case, you made a reasonable decision, given your knowledge of the field, and it was undone by a proofreader. But the question isn’t “Who was right?” It’s “What went wrong?” And what went wrong is that you didn’t communicate a departure from style to the proofreader. Next time, pass your style sheet along so the proofreader can honor your decisions. Your imagined rewrite is the perfect solution, but I understand that you’re still curious about the comma situation. Personally, I like the way you styled it in your question (except that the comma goes inside the quotation marks, as you guessed). The problem is, I can’t justify the comma in any of the stylebooks at hand. The Chicago Manual of Style allows it only if the quoted chunk is the title of something (a song or journal article). But to me, logic dictates that your comma be sanctioned. I say go for it. If you get in trouble, let me know. I have a question about previous publication—several years ago I posted a short story on Gather.com. This short story became the basis for the first chapter of the book I'm writing. The original story was removed when I started writing the book, and the current version of the story is at least 50% changed from the original. What impact does this have on chances for publication? What can/must I do to clear any issues this creates? Would it be better to remove the existing first chapter and write an unrelated new one containing nothing of the original other than character names? I'm hoping you can address these questions in your blog, as I'm sure I'm not the only person in this situation. Thank you very much for your time. First, kudos to you for considering who has rights to this content, even though you created it. How civilized of you! I checked out the terms of service at Gather.com, which state clearly that they “do not claim ownership of Content you submit or make available for inclusion on the Service.” By posting there, you did grant them “world-wide, royalty free, perpetual, unlimited, and non-exclusive license(s) to use, distribute, reproduce, modify, adapt, create derivative works, publicly perform and publicly display such Content via the Service or on any other Skyword property”—but that still allows you to use the content in any way you like. Although you should disclose the previous publication to your publisher, I doubt that it will be a problem. Their rights department will advise you. The lesson here is one you’ve heard before: read the fine print! When Skyward collects an Oscar for the movie of your first chapter, you’re going to seriously regret posting there. Readers: I would love to hear from you at my Questions and Suggestions page! 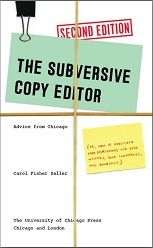 Deputized by The Chicago Manual of Style, the Subversive Copy Editor spoke on Tuesday with an executive at the Associated Press (on condition of anonymity) about the recent changes to the AP Stylebook. What follows is a transcript of our meeting. SCE: Thank you for agreeing to talk with me today, and congratulations on your exciting new style changes. I’m sure it’s a great relief to AP to be able to cut its hyphens budget. SCE: You know—now that you aren’t hyphenating “e-mail” and “hand-held” and such, you’re going to need a lot fewer hyphens than previously. In fact, I’m wondering whether budget constraints were the impetus for the style changes. AP: Well . . .
SCE: Can you tell me your plans for future overages of hyphens at the AP—for instance, how many are already stockpiled, and whether you’ve considered the storage costs involved in keeping them? SCE: Isn’t it true that for decades AP representatives have been buying up hyphens on international markets, leaving manuals like CMOS to scrounge for them at inflated prices? SCE: And isn’t it true that AP is sitting on vast warehouses now, and by not offloading your surplus, you’re hoping to create a hyphen shortage for competitors? AP: Well, we don’t actually consider CMOS a competitor. SCE: Aha, I see. In that case, I suppose you would consider it a favor for the Manual to take a little punctuation off your hands. Not that we don’t have plenty ourselves, you understand. It’s just that as distributors for over fifty publishers, we’re in a position to house them comfortably. That is, if you need to get rid of them. AP: Thank you. It’s very kind of you. I’ll look into it. I’m sure we have plenty of hyphens for everyone. I’ll see what I can do. I’ve written before that if you’re knocking yourself out trying unsuccessfully to find a rule, it might be because there isn’t one. But what about when you almost find it? No style guide can be exhaustive. Sometimes a writer or editor has to use judgment. Look at ABC and DEF, and use the deductive reasoning you learned in algebra to adapt them for CDE. Remember why you keep a style sheet: to record decisions that aren’t covered by the book or that depart from its recommendations. Rules are not shoes: sometimes you can make a rule fit. And consider this: if it isn’t covered in the manual, who’s to say it’s wrong? I have been writing for more than 12 years, first as a reporter for a newspaper, then in public relations and communications. I have done some proofreading recently for an academic publisher on the side, and would like to also get some work copyediting books. What would be the best steps I could take to break into copyediting? Getting work with a publisher is the hard part, so you’re well on your way. I have several suggestions for you. First, understand that you might have to unlearn many of your old tricks. As you have discovered, proofreading and writing are not copyediting, and journalism is not academe. Your years of accumulated writing instincts can work against you, so be humble and think of yourself as a student. Next, ask your assigning editor what she requires from copyeditors she hires. Typically, there’s a test, so if she’s willing to describe it, you’ll know what you need to learn. Most hirers will want a demonstration of your knowledge of editing marks and of their style manual; I once had to answer questions about general cultural knowledge. It’s a good bet that you will have to edit a page or two of difficult text. If you already know the marks and the style manual, you might do well on an editing test, but you can increase your chances through instruction and practice. You could take an editing class, volunteer to copyedit the work of a friend, or read promotional materials for an impoverished nonprofit. Seek detailed feedback. Teachers of editing classes are potential referees and might know of job openings. It’s possible that a hiring editor will also require “experience.” Yes, that old conundrum: how do you get experience if you can’t get work without it? The answer is to seek it lower on the food chain. Ask for work that isn’t full-blown copyediting but that involves more than proofreading. Maybe your publisher prints second editions of books that feature only a new preface or introduction; or maybe you could copyedit in-house materials. If your editor is interested in mentoring you, you might offer to do some reduced-fee or pro bono copyediting under supervision. If you can do one assignment well and build on it to get more work from that employer, it probably will not be difficult to parlay your accumulated experience into work for other publishers. Your assigning editor might be willing to recommend you. At a certain point in your development, people will hire you on the basis of your experience and references, without a test. Some experienced freelancers say that word of mouth is their most effective method of finding new clients. Finally be sure to take advantage of online resources. The Editorial Freelancers Association website is a good place to start. Good luck! By an evil coincidence, the deadline for sending the acknowledgments section of my new book* to my editor was last Sunday—on Oscars night. I had already drafted brief thanks to him, my writing group, and my family, and was merely going to proofread and polish before sending. But as I sat in front of the TV with laptop and popcorn watching the acceptance speeches, my draft began to look a little cold and stingy. I added some warmth, a few more names. A touching anecdote. By the end of the evening what had started as a single paragraph ended up looking like the end-credits roll for Lord of the Rings rewritten by Sally Field. I started over. For some reason, though, when it’s my turn, I can’t seem to control myself. For The Subversive Copy Editor, I drafted four pages with over 100 names. I emailed it to my editor upstairs, and within minutes he was at my door with “that look” on his face. (This is one disadvantage of being published where you work.) “You need to cut 75 percent of this.” I was mortified. I cut it in half and snuck 20 names back in on the page proofs (yes, indeed—an advantage of being published where you work). The problem is that acknowledgments are so personal. That’s what makes them meaningful to yourself and a small number of others and annoying to everyone else. To the unconnected reader, they’re just self-serving and promotional. In the end, I gave up. No acknowledgments. I know that my friends and family aren’t vain about seeing their names in print. I know that in one way or another, I’ve helped and encouraged them all in their own endeavors. I know child readers won’t care. I’m afraid of leaving someone out.